Is the tech entrepreneur planning a satellite internet venture? Elon Musk is one of the most intriguing people in the world today. Having made his billions as one of the founders of Paypal, he's now better known as a serial entrepreneur behind two of the world’s most exciting companies: Tesla makes the world’s coolest cars, and SpaceX is aiming to revolutionize space travel with its reusable rockets, and even take humans to Mars if Musk’s grand vision is to be believed. These two companies are currently separate, united only by Musk as CEO and major shareholder. They seem to have separate missions, with few synergies between them. But could Musk have a secret plan? Last year tech CEO Gavin Sheridan came up with a highly plausible piece of speculation, which he posted about on Medium. In the piece, he argued that Musk’s plan isn’t just to get to Mars or build fast cars: he speculated that Musk’s ultimate aim is to use his companies to become the world’s biggest telecoms provider. Internet via satellite already exists – it's just painfully slow. For example, Iridium’s current global service, which is powered by a constellation of 66 satellites, offers data rates of just 10kbps – yes, that's even slower than your old dial-up modem. This might be fine if all you want to do is upload the GPS coordinates of a container ship as it crosses the oceans, but it's much less useful for, well, pretty much everything. There are some faster services available from other companies, which offer speeds comparable to 3G, but none are global, and instead use satellites that are specifically focused on limited geographic areas. There are newer networks in development. Inmarsat is in the process of launching Global Xpress, a constellation of five satellites that will deliver speeds of “up to” 50Mbps download/5Mbps upload. But rather than being something that ordinary consumers can tap into, the service is being aimed at big corporate customer and governments, as the network simply wouldn’t have the capacity for our normal internet communications – to do that it would require thousands of satellites. Going back to Gavin Sheridan’s speculation, if he's right then Elon Musk is thinking much bigger. Perhaps he isn’t just thinking about connecting up oil rigs and aircraft carriers. What if, instead, SpaceX’s ambition is to destroy all of the existing ISPs and phone networks in the world. How so? By delivering high-speed internet connectivity directly from satellites, to millions of devices. So how does space-based internet connectivity tie together Musk’s companies? Sheridan’s thinking is that his pioneering work with rockets will enable SpaceX to more cost-effectively launch the 11,943 satellites Sheridan reckons would be required for a complete global network, and then the satellite connections will be able to transmit to ground stations. What’s especially clever is how the satellites would be deployed: 4,425 of the satellites would be low-Earth orbit, with a further 7,518 in very low-Earth orbit – these latter satellites positioned over major cities in order to provide greater redundancy and lower latency, in a similar way to how there are more mobile phone masts in cities, to ensure that everyone can get good service and that connections aren’t too slow or overloaded. Next is where Tesla’s work comes in: in addition to making cool cars, the company is arguably the world leader in battery technology. In 2016 the company bought SolarCity, a solar panel company co-founded by Lyndon Rive, who happens to be Musk’s cousin. Together, the combined company has solar generation and battery storage technology – which might be perfect for powering rural ground stations. According to Sheridan’s back-of-the-envelope calculations, this could conceivably deliver connection speeds of up to 1Gbps, anywhere in the world. And if Musk can use such a network to cut out all of the fixed line and mobile operators in the process, he reckons it would immediately create a trillion-dollar company, and wipe out everyone from Comcast in the US to BT in the UK in the process. Science fiction or plausible reality? Pretty good conspiracy theory isn’t it? And – perhaps unsurprisingly – the potential of satellite internet isn’t something that SpaceX has ignored. In 2015, the company’s office in Redmond began development of what became known as Starlink – the company’s internal name for the project to build such a satellite network. Three years on, the Starlink team is already making what appears to be significant progress. In February the company launched two prototype test satellites – dubbed Tintin A and Tintin B. They are essentially being used to test the underlying technology: they connect to each other using V-band radio signals, and then use the Ku/Ka bands to communicate with the Earth, just as a real life service would. 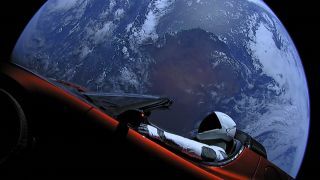 According to Musk himself, the tests appear to be going well (though he would say that) – the satellites reportedly have a latency of just 25ms, which, as Musk pointed out on Twitter, is low enough to use to play online games. SpaceX isn’t the only business to recognize the game-changing possibility of satellite internet. Perhaps the next most plausible company to eventually achieve this is OneWeb. It's pitching a constellation of 882 satellites in low Earth orbit, launched by Blue Origin, the rocket company owned by Amazon founder Jeff Bezos. The one advantage it does have in this space is that the International Telecommunications Union, the global body that regulates radio communications, has approved the company to offer services on this band. It’s disadvantage relative to SpaceX? It hasn’t actually launched anything into space yet, with its first launch having recently been pushed back to the end of this year. So could we be on the cusp of being able to play Fortnite deep within the Amazon rainforest? Sadly, when I contacted SpaceX to ask if I could have a chat to anyone working on Starlink, after initially being interested in what I was writing, they didn’t seem keen to talk. But what we do know is that the plans for Starlink are pressing ahead, even if the timeline is a little sketchy. Musk says the satellite design will undergo another revision before the company starts cranking out the thousands of units that would be required. According to the most optimistic version of the timeline, that means we could be connecting up to Starlink internet in three or four years… but, of course, we know what Musk is like with deadlines. Think you've got the best innovation idea? Then you could win £10,000!